Austin Warren, the son of 1982 Xenia High School graduate Alana Walke (left), recently was drafted in the sixth round of the Major League Baseball draft by the Los Angeles Angels on June 6. Warren, a right-handed relief pitcher for the University of North Carolina Wilmington is the grandson of former Xenia YRC baseball coach John Walke (right) of Xenia. 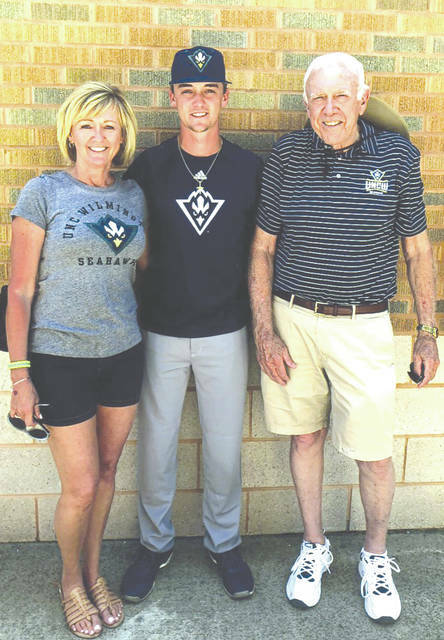 https://www.fairborndailyherald.com/wp-content/uploads/sites/50/2018/06/web1_AustinWarrenUNCW_PS.jpgAustin Warren, the son of 1982 Xenia High School graduate Alana Walke (left), recently was drafted in the sixth round of the Major League Baseball draft by the Los Angeles Angels on June 6. Warren, a right-handed relief pitcher for the University of North Carolina Wilmington is the grandson of former Xenia YRC baseball coach John Walke (right) of Xenia.